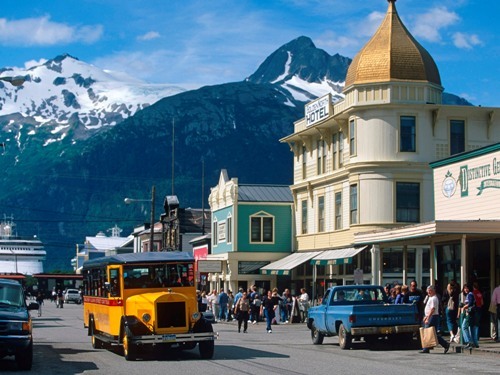 Rich history and stunning scenery combined with its location in Alaska’s Inside Passage – it’s no wonder that Skagway is often picked by visitors as one of the state’s most interesting towns to visit. Originally settled by Tlingit Indians, the town is famous for being a hotbed of prospecting activity during the Klondike Gold Rush. To add to the town’s allure, Jack London’s book, “The Call of the Wild” is partially set in Skagway. While visiting you’ll have numerous opportunities to create your own stories to tell to family and friends over and over again! Here are a few suggestions of must-see sights and must-do activities according to the Skagway locals. While in Skagway, we recommend staying at the Westmark Inn Skagway to experience lodging that captures the true spirit of the Klondike Trail. With its Victorian era décor, rustic setting and warm Alaska hospitality, the Westmark Inn Skagway provides a calm and comfortable stay for travelers. Jim Sager, hotel manager at the Westmark Inn Skagway has called Skagway home for more than 20 years and enjoys the breadth of activities available in his backyard including the historic White Pass & Yukon Railroad. The railroad was built in 1898 during the Klondike Gold Rush; and, more than a century later, you can re-live the adventure in a comfortable and safe parlor car. Another benefit of visiting Skagway is the large number of hiking trails, many of which have trailheads downtown. Mark Jennings, manager at M&M Tours and a Skagway resident for over a decade, prefers experiencing his town and the surrounding area on foot via the hiking trail system. Mark’s favorite hikes are Lower Dewey Lake and AB Mountain. The Dewey Lake hike is a short hour round-trip. You can even pack a lunch to enjoy on the lakeside picnic tables. For the more adventurous hikers, the AB Mountain hike is a solid half-day trip winding around the mountain trails, about 11 miles in total. Both locals and visitors adore the Grizzly Falls Ziplining expedition. Fast, fun and exhilarating, this 4-hour adventure takes you on an unforgettable flight through the Southeast Alaska rainforest. Great for people of all ages and abilities, you’re sure to remember this excursion for years to come. If you long to visit Skagway but would prefer to have someone else deal with the logistics, we recommend Gray Line Alaska’s Alaska & Yukon highlights tour. Historic landmarks, exciting excursions and stunning scenery are all waiting for you in picturesque Skagway, Alaska.